The PR300-U is an enhanced version of the PoweRack 300R. This a premises powering unit that integrates NT1 caging, 48 volt DC power, and battery backup in a single unit for powering ISDN telephones and Lucent B-300 NT1's or equivalents. The PR300-U is available in four models that house and power 12 to 48 NT1's and provide power for 24 to 96 phones in a multipoint mode. 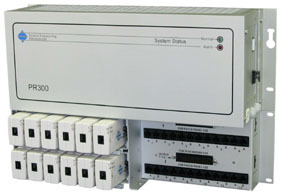 In addition, the 24 and 72 line versions of the PR300 are field upgradeable by adding a 300R-U NT1 cage. The PoweRack 300-U can be either wall or rack mounted. The small footprint and simple installation of the PR300-U allows a cost-effective installation without the requirement for punchdown blocks (an optional wiring harness is available to facilitate NT1 input cabling). Battery holdover can be increased by adding external battery packs. During extended periods of utility outage the batteries are protected from over-discharge by the built-in low voltage detector and disconnect circuit. Remote monitoring is provided by a contact closure that can be interfaced to a remote alarm unit. All PR series units are mountable either on a wall or on 19" racks. Mounting brackets for 23" or 25" racks may be ordered as options (specify 23RM or 25RM after the model number).